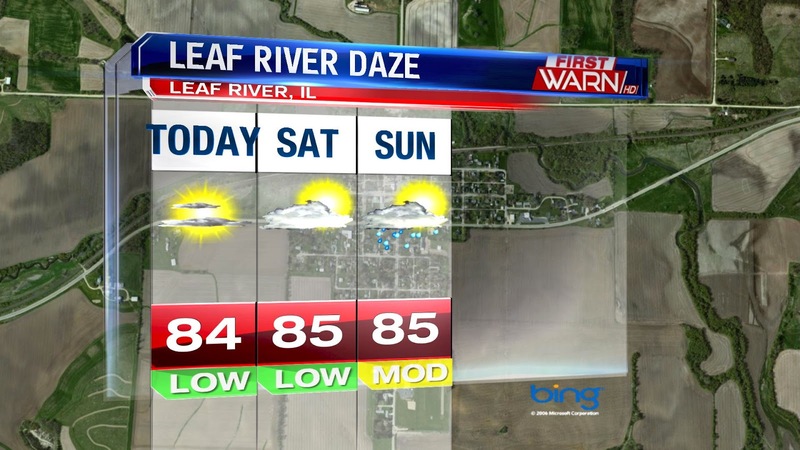 Today will be a perfect day to kick of the start of Leaf River Daze in Leaf River, IL. Temperatures will rise into the mid 80's with mostly sunny skies. Friday night will be nice for vieiwng the fireworks, skies will be clear and temperatures will have cooled off. Saturday will be a lot like today with highs near 85° and lots of sunshine. 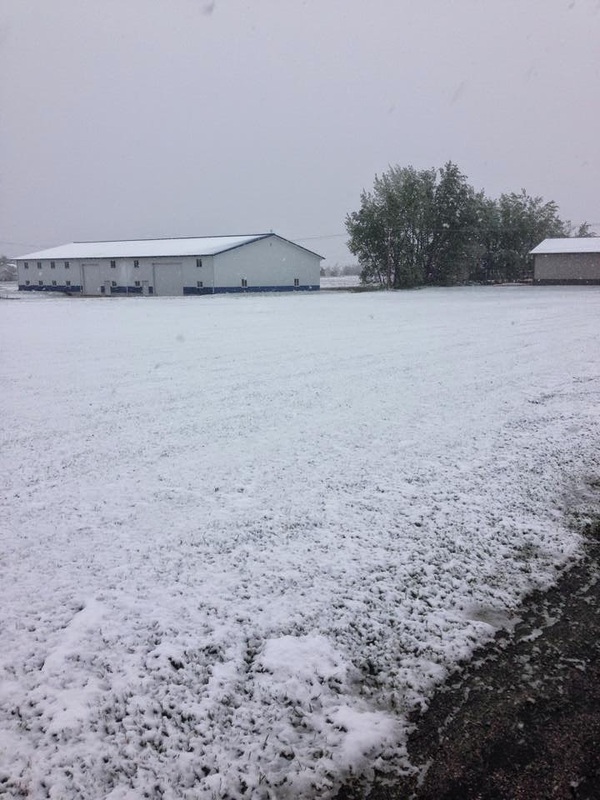 It will be perfect to grab some ice cream and watch the tractor pulls. The majority of Sunday will be dry, but there is a threat for a few isolated showers Sunday morning and then later again Sunday night. The last day of River Daze won't be a wash out by any means, but you will feel more humity with highs reaching 85°. Friday also kicks of the begining of City Market in Rockford, thats today from 3pm to 8pm. You'll want to make sure to bring the sunscreen if you'll be outside for an extended period of time the next couple of days. You'll really be able to feel the sun with little cloud cover. 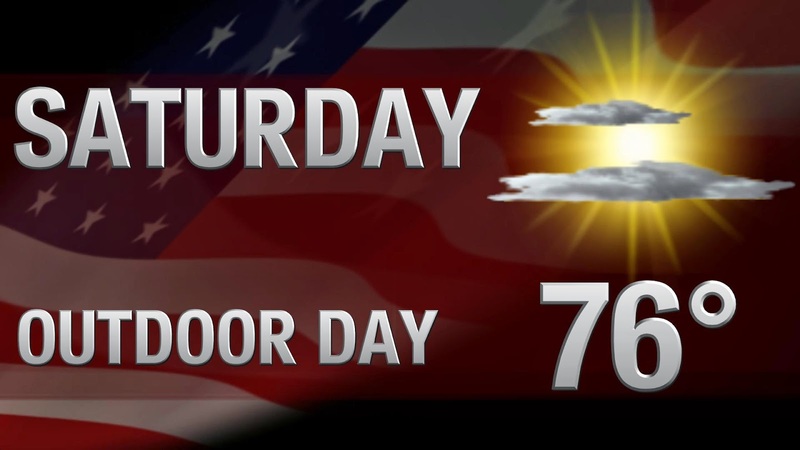 Overall, the weekend will be great to go outside and enjoy the weather! The end of this week will remain quiet as high pressure builds to our north and east. We'll see highs in the low 80's the next few days, but the humidity will be low because the high will act as a block against the moisture. As we look towards the begining of June we will see a more active weather pattern as the jet stream pattern shifts to the southeast . This will shift the flow from SW to NE, ushering in warm and moist air through nothern Illinois by Sunday. A cold front moving south and then mixing with warm moist air will create the threat of thunderstorms will heavy rainfall through Tuesday. Because there will be a lot of energy in the atomosphere and a sharp shift in wind speed and direction in the heights of the atmosphere, there could be several large scale complex thunderstorms, or MCS's, through Wendesday. After a couple days of highs in the middle 80's, the mid 70's won't feel too bad this afternoon. 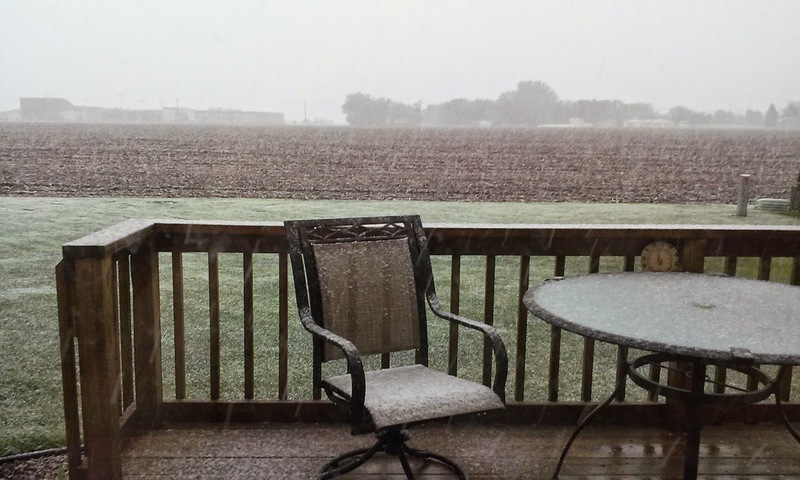 That's because the cold front that was responsible for the heavy rain and flooding in southern Wisconsin and far northern Illinois Tuesday evening has passed south of the Stateline. As of 12:30pm, the front sits from roughly south of a line from Chicago to Sterling to Dubuque, IA. Building instability has been enough to get showers and a few thunderstorms to fire up from La Salle westward towards Davenport and Cedar Rapids. Along and south of the cold front is where thunderstorms are expected to develop going into the afternoon. 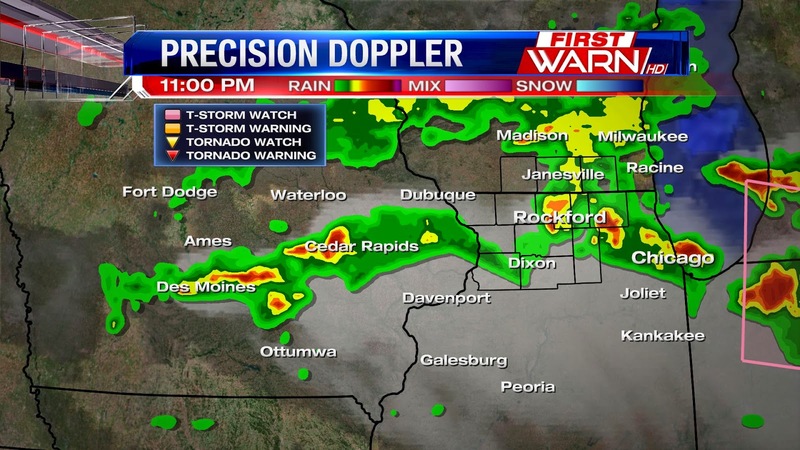 While a few showers and even a rogue thunderstorm can't be ruled out closer to home this afternoon, the greater potential for storms will be south and west of Rockford. High pressure will move into the picture later tonight and Thursday pushing the front even further south meaning skies should stay dry going into the start of the weekend. The end of the weekend into early next week could be a bit of a different story. 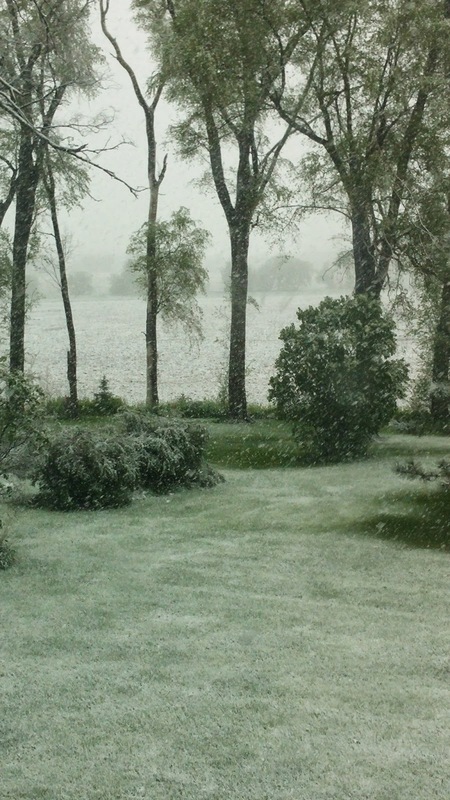 A little more active weather pattern setting up for the beginning of June could be in store. More on that coming up in later posts! A Flash Flood Warning has been issued for Rock and southeastern Green Counties in Wisconsin until 11:15pm Tuesday. 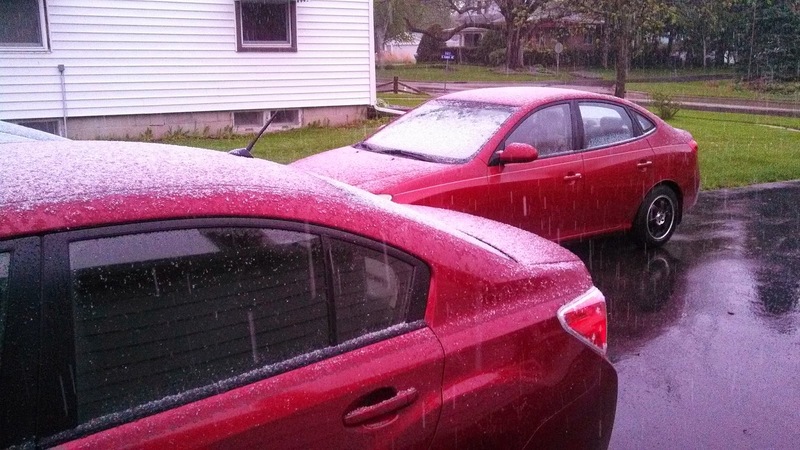 Scattered showers and thunderstorms rolled through early Monday morning as heavy rain poured for some. As of 10:00am, most of that rain has moved on with breaks in the cloud cover that will last through early afternoon. Those breaks will allow temperatures to climb into the middle 80's. Not only that, but with the rain and rising dew points today it will definitely feel a lot more summer-like for this Memorial Day afternoon. Additional thunderstorms are likely later today and early this evening but the threat for severe storms will remain low, despite the building instability. The reason: there just isn't enough support in the upper levels of the atmosphere. up thunderstorms with the heating of the day. 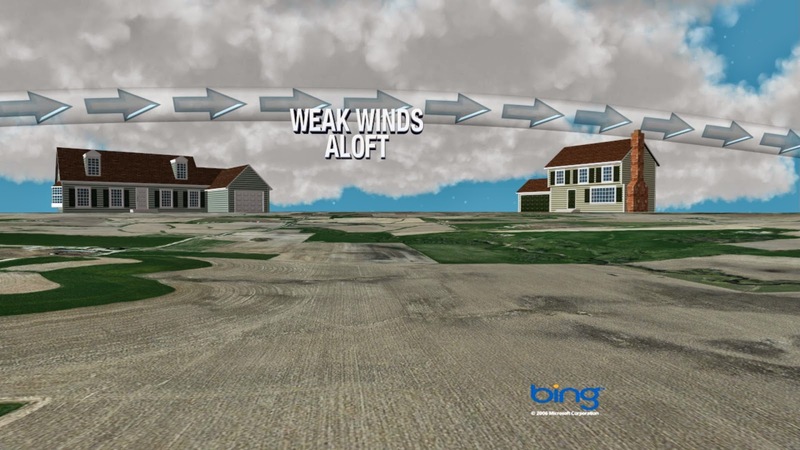 In order to get severe weather to develop, you need a few key ingredients: those being moisture, instability and lift. While the moisture and instability will be present, as felt with the higher humidity values today, there isn't much lift - or rising air- going on in the atmosphere. Without that, getting organized thunderstorms to form will be a little difficult. Also, the overall winds within the jet stream are fairly weak limiting the amount of wind shear. However, any thunderstorms that develop today will contain heavy rain in isolated locations as well as a couple stronger wind gusts. Unfortunately, trying to pin down exactly where those isolated storms develop will be a bit more challenging. As with this morning, not everyone will experience rain and the day won't be a complete washout. Just know that as the heating of the daytime increases, between 2pm and 6pm, that's when the greatest storm threat will be. As the evening wears on the storm threat will decrease, but the humidity will remain. Stargazers, get excited! 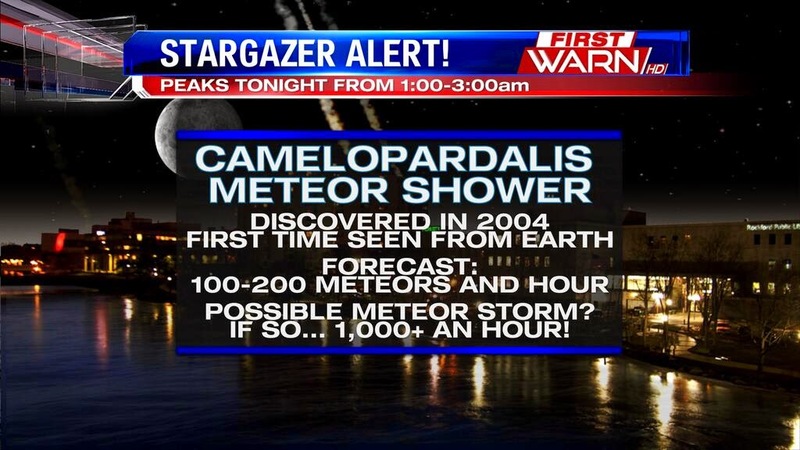 Clear skies tonight will mean perfect viewing for a brand new meteor shower called the Camelopardalis (Pronounced kah-MEL-oh-PAR-dal-iss). The comet responsible for tonight's meteor shower was discovered in 2004 and this will be the first time this meteor shower can be seen from Earth. 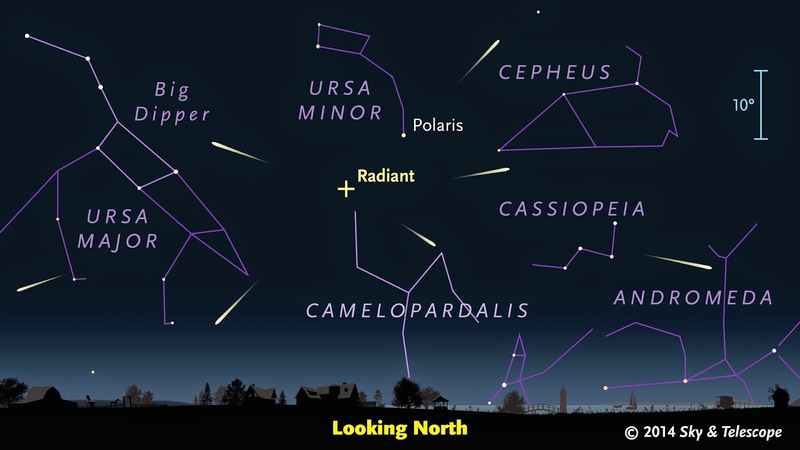 Where: Meteors will originate in the northern sky near the constellation Camelopardalis (Thus the name), but will be able to be seen anywhere in the night sky. The beautiful weather that we've had the past few days will continue through the majority of Memorial Day weekend. With high pressure in control, Saturday will be a great day to spend outside, with a high of 76° under mostly sunny skies. Saturday night looks to be quiet and cool, down to 50°. High pressure will move southeast Sunday making it another great day to be outside with highs near 80°. A little more moisture will begin to stream up from the gulf, making it feel a bit warmer. The majority of Sunday will remain dry, but going into Sunday night there is a small chance of rain as a warm front moves through. 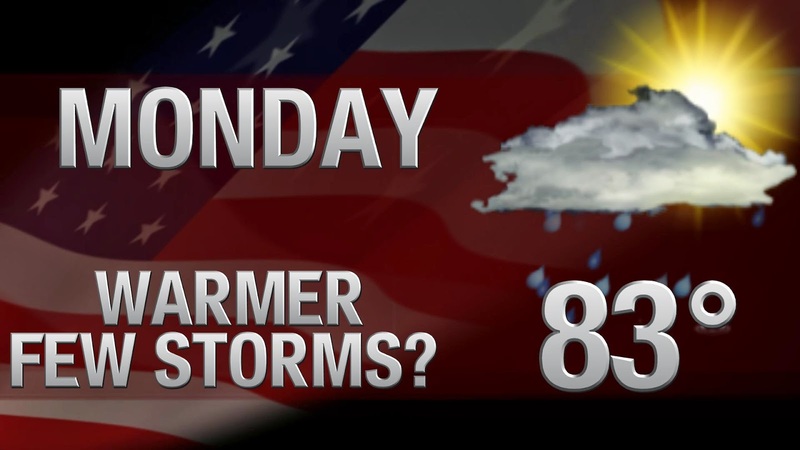 Going into Memorial Day, the threat for storms will increase as a weak cool front moves through; we'll be in the low 80's. Even though we are in a slight deficit in rainfall totals so far this year, drought conditions are continuing to improve throughout Illinois. Wisconsin and the rest of the Midwest are also improving. 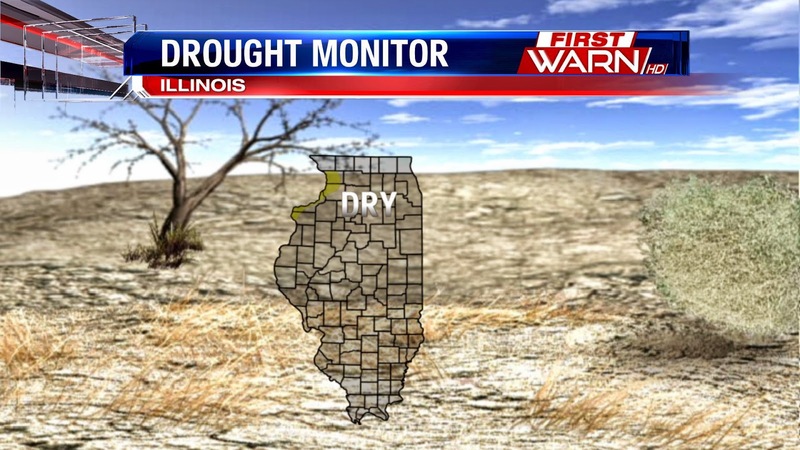 Currently Illinois isn't in a drought, but 2% of the state is abnormally dry. This is a large improvement from 3 months ago when 28% of the state was ranked abnormally dry and 20% was in a moderate drought. 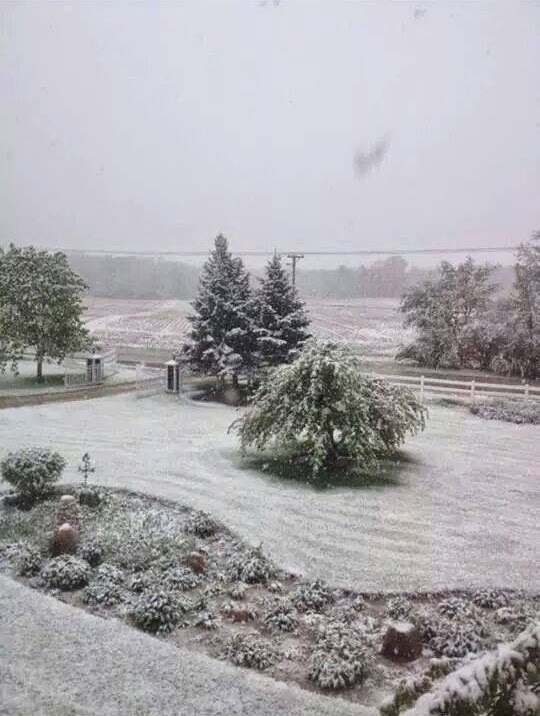 Wisconsin is doing even better, the entire state is free of drought and dryness. Compared to 3 months ago when 40% of the state was was ranked from abnormally dry to severe drought. The new meteor shower, May Camelopardalis will be in view for the entire Northern Hemisphere tonight, but the best views will be in the middle latitudes. You'll be able to see some meteorites or "shooting stars" from 9pm through about 6am, but the best time to watch will be from 1am to 3am CDT. This meteor shower is a result of the Earth passing through the debris and dust stream left from the comet 209P/LINEAR. The most interesting fact about this shower is that the debris stream isn't any new debris, it's actually left over from when the comet passed in the 1800's. This shower gets it's name from the constellation Camelopardalis, which is near the north star, because it looks like the meteors are coming from this constellation. Some forecasters are predicting that you could see up to 200 meteors per hour, and rivals the Perseids Meteor Shower in August. You see the "shooting stars" when dust and debris enter Earth's atmosphere and begin to burn up. Tonight will be a perfect night for the shower, with lows in the upper 40's, light winds, and little to no cloud cover. But, if you don't want to watch the shower outside, you can watch a live stream on NASA's website. 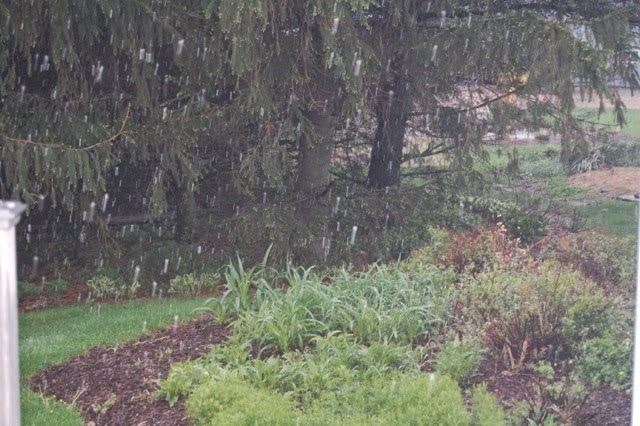 But looking back into March we recieved 6.05" of rain for the month. 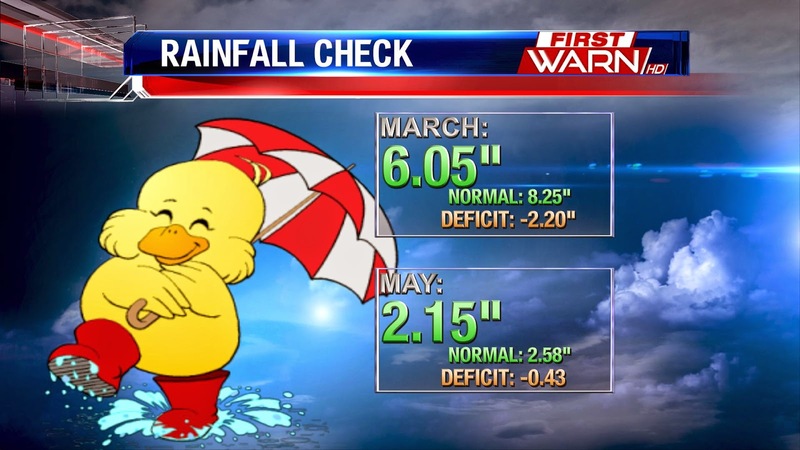 The average rainfall in March is 8.25", which leaves us in a deficit of 2.20". This is something we will want to keep an eye on because we don't want to get too far behind so early in the season. The next few days will feel more spring- like. A high pressure pattern continues to build just to our north Thursday and continues to stick around for the next few days. The high acts as a blocking mechanism to keep all of the active weather and rain to our south. Cooler air is finally settling in so highs today will be in the low to mid 70's. Temperatures will contiue to rise as we look into the Memorial Day weekend, with temperatures in the low to mid 80's Saturday and Sunday. The chance for rain comes back later Sunday night and into Monday. Summer-like temperatures will continue into next week, with highs in the low 80's. 11:00pm Update: All severe watches/warnings have now expired for the Stateline. 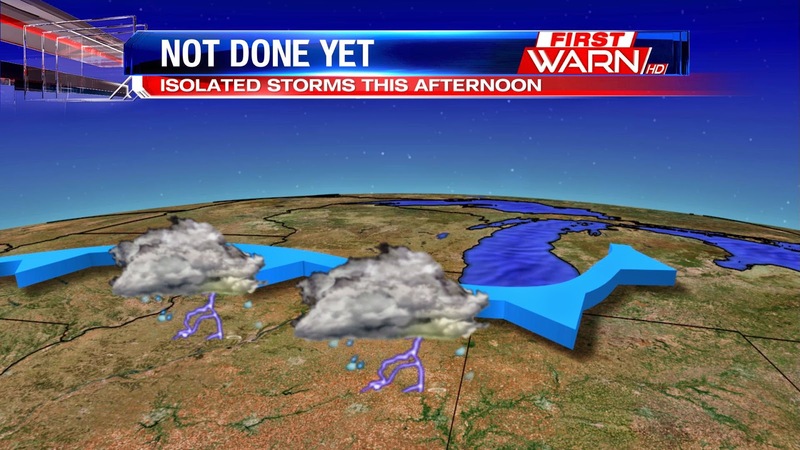 A few lingering storms are still possible later tonight, but will stay below severe levels. 10:25pm Update: Severe T-Storm Warning for Ogle until 11:00pm. 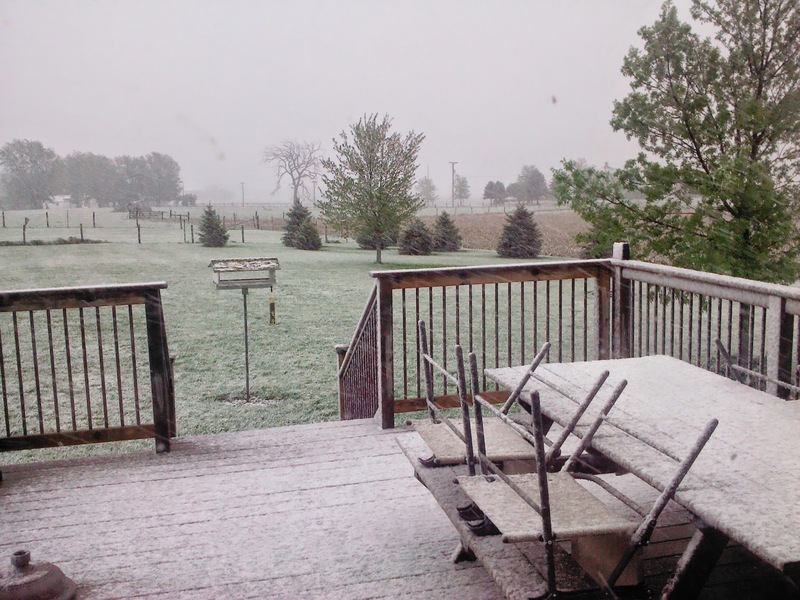 Half dollar-sized hail possible. 9:10pm Update: Severe T-Storm Warning for western Ogle until 10:00pm. 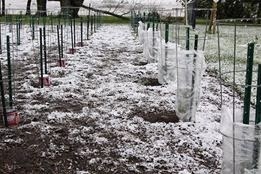 Quarter-sized hail possible. 8pm Update: Severe Thunderstorm Watch continues for northern Illinois and southern Wisconsin until 11pm. 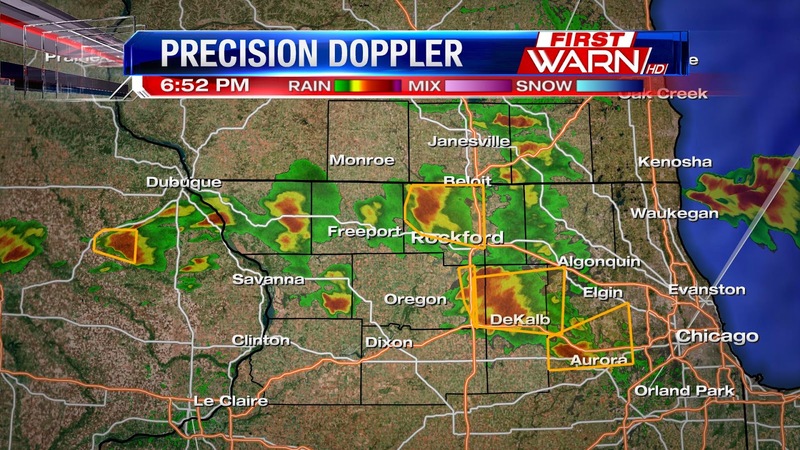 Active severe thunderstorm warnings at the moment remain in Jo Daviess and Carroll counties. Currently watching the storm northwest of Savanna which has shown some signs of weak rotation. We'll continue to monitor this storm as it moves to the east. 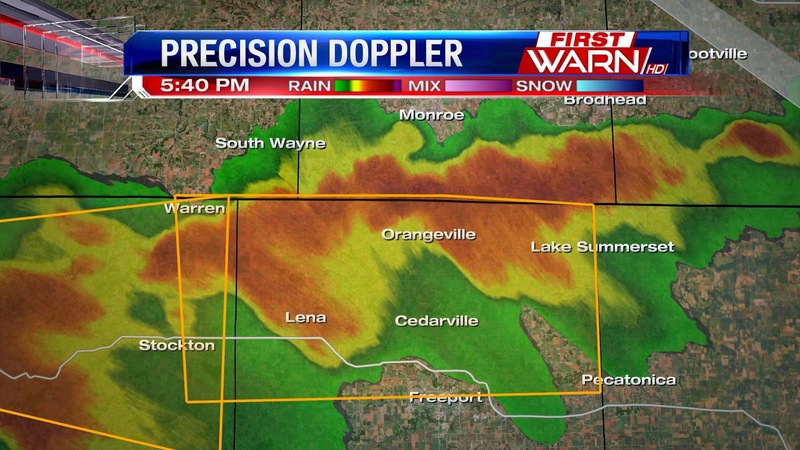 Severe Thunderstorm Warning for eastern Ogle and western DeKalb counties until 7:15pm. 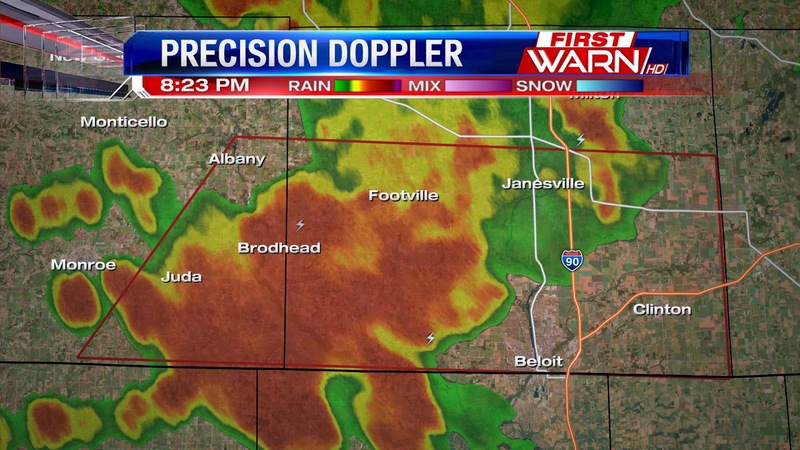 Severe Thunderstorm Warning for Winnebago County until 7:15pm. 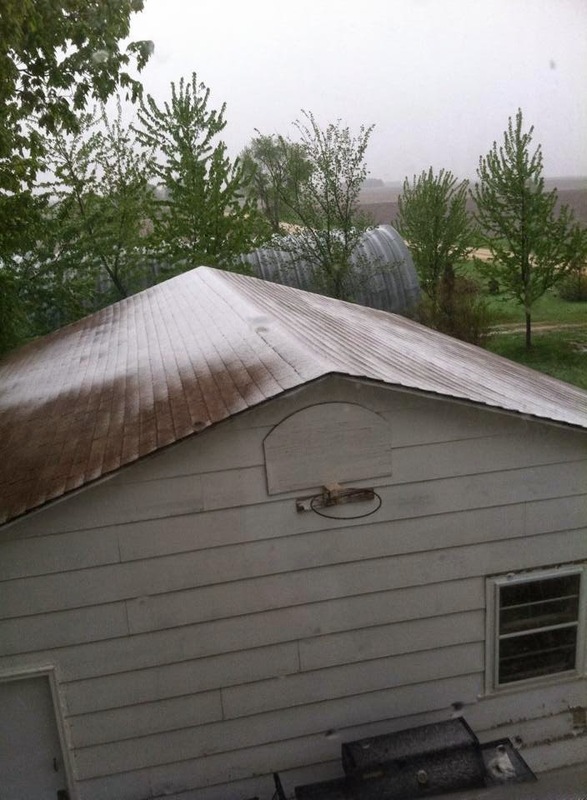 Storm moving into DeKalb County has had a history of producing large, damaging hail. 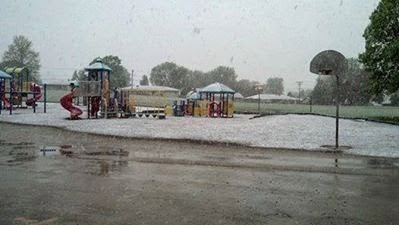 Hail up to golf ball sized has been reported. 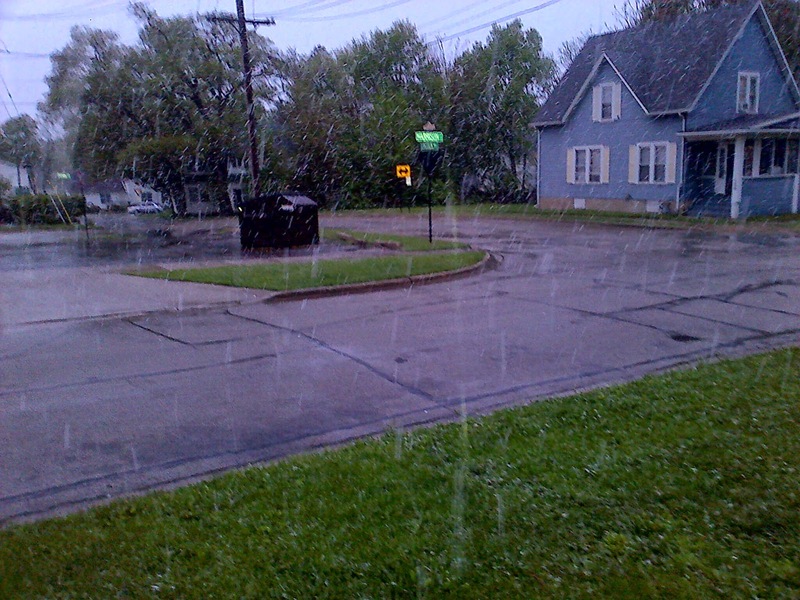 The storm moving through Winnebago County will be capable of producing quarter sized hail. Stay indoors and away from windows. Severe Thunderstorm Warning for Stephenson County until 6:15pm. 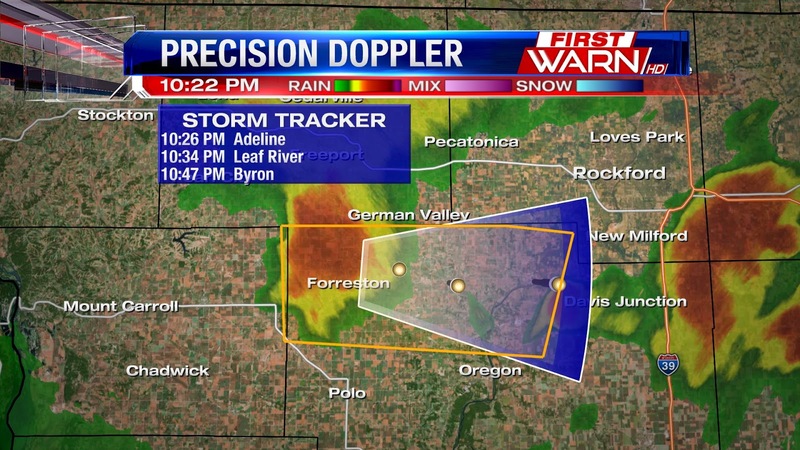 Storm was locted near Nora and moving east at 30 mph. 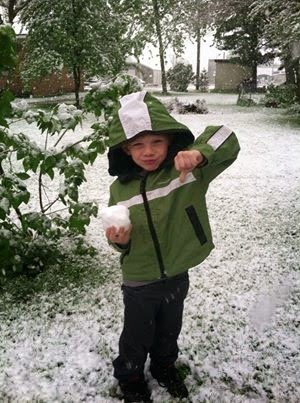 Areas affected will be Lena, Cedarville, Dakota, Orangeville, Winslow, Dakota, Lake Summerset and Dakota. 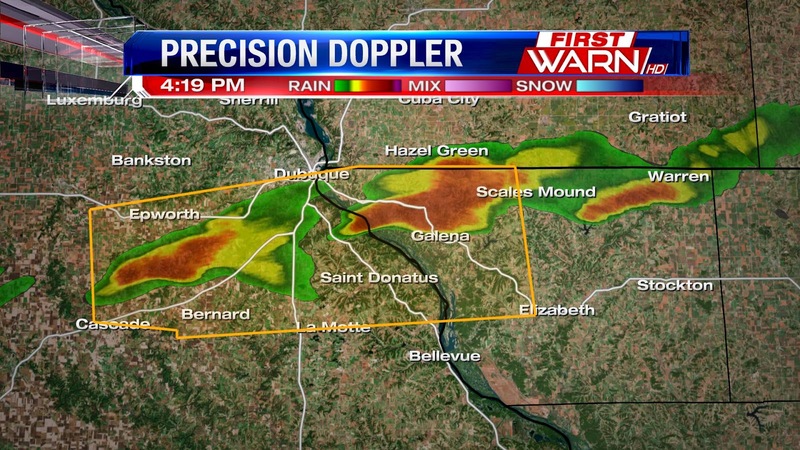 Severe Thunderstorm Warning issued for western Jo Daviess County until 5:15pm. 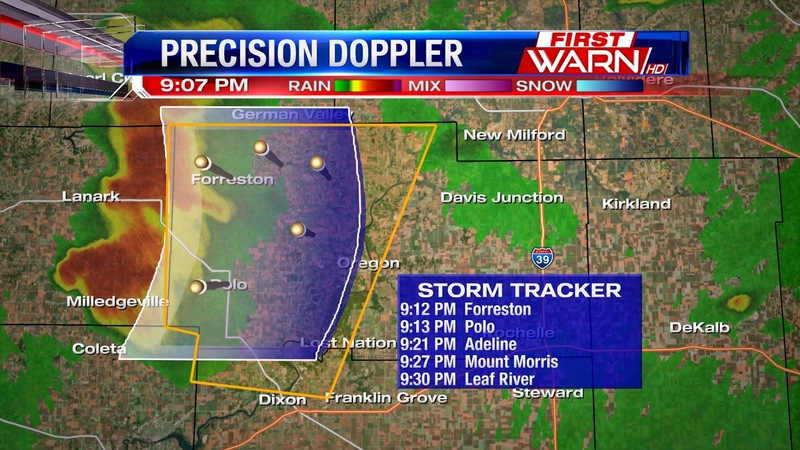 Storm is moving east at 25 mph. Storms starting to fire along the cold front near the Wisconsin/Illinois border. 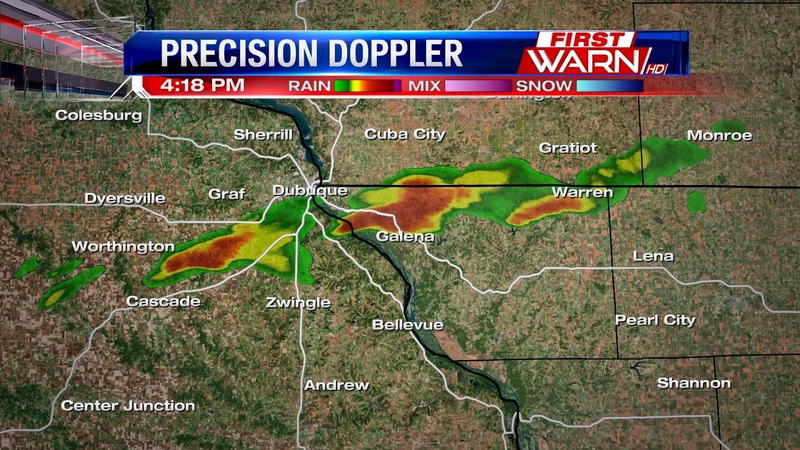 The storm near Galena and Scales Mound will be capable of producing half inch diameter hail. Severe Thunderstorm Watch issued until 11pm for the following counties: Green, Rock and Walworth in southern Wisconsin and for Jo Daviess, Stephenson, Carroll, Whiteside, Winnebago, Ogle, Lee, DeKalb, Boone and McHenry counties in northern Illinios. 3:00pm Update: Mesoscale discussion out from the Storm Prediction Center concerning possible watch this afternoon. 2:00pm Update: The threat for strong to severe storms remains going into Tuesday evening. Mainly clear skies through the morning and afternoon has built up instability across N. IL and S. WI. As of right now, two places for possible storm development look to be likely. 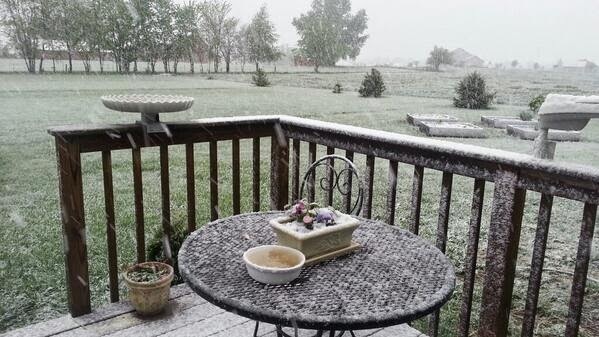 The first in southern Iowa closer to low pressure and the second across Wisconsin near the cold front. We've likely got at least a few more hours before any storms begin to fire with the best chance for storms locally after 5pm. Biggest risk still remains large hail with any individual storms that may form along with strong, damaging winds. While the tornado threat is low, it isn't zero. The window for any possible tornado producing storms will be early, followed by the wind threat late this evening. We'll continue to provide updates right here, as well as on Facebook and Twitter, as needed. For the full discussion from the Storm Prediction Center regarding the storm potential later today, click here. As Meteorologist Brandon Arnold mentioned yesterday, the threat for strong to severe thunderstorms remains for this afternoon and evening. The Storm Prediction Center has us under a slight risk for severe weather. 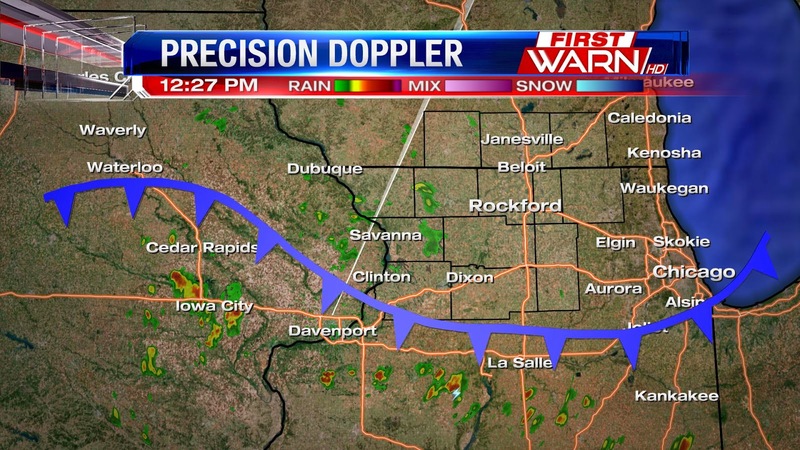 Storms look to develop right over or very near the Stateline, as early as 3pm or 4pm, but likely between 5pm and 7 pm. For this afternoon, a strong southerly wind will bring in moisture, which will help raise dew points into the low 60's. With temperatures in the upper 70's to low 80's there should be enough instability to trigger a few pop-up storms in the afternoon. Late this afternoon, storms will develop right along the cold front that will move through this evening. 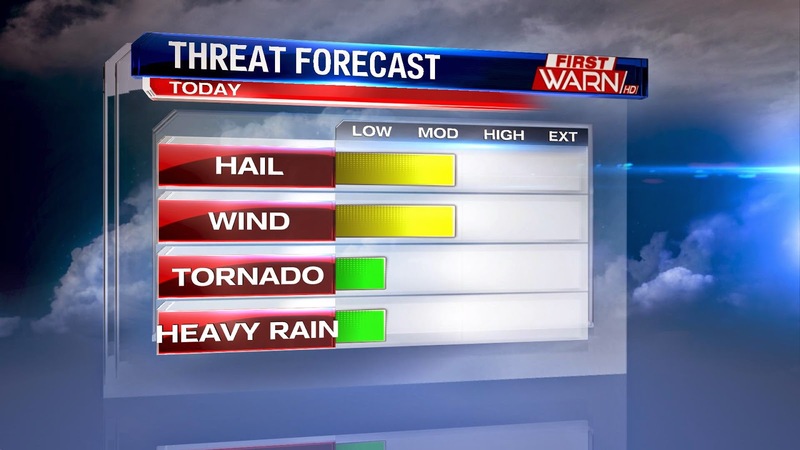 The main concern with these storms will be the threat of strong winds and hail. We've got one bump in the road to get through before we're looking at a beautiful week and holiday weekend. 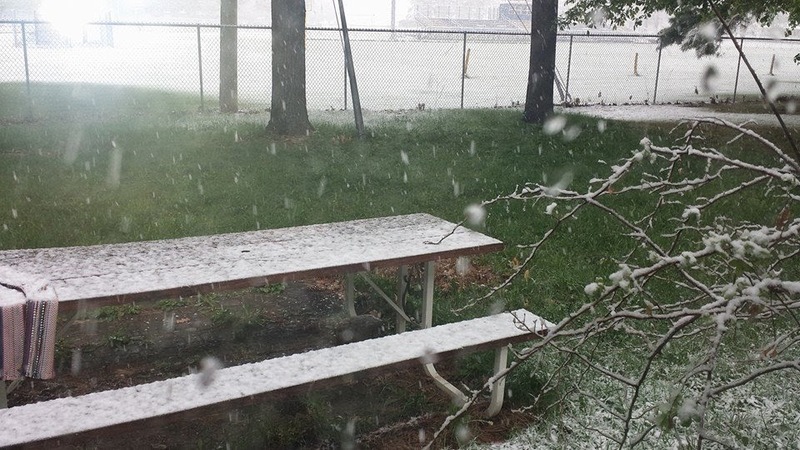 We'll be tracking the chance for thunderstorms on Tuesday. A few pop-up storms will be possible in the afternoon with the heating of the day. Better storm chances will come Tuesday evening with a cold front. At the moment, the Storm Prediction Center has us under a very low risk for severe weather, but a few isolated storms could produce strong winds and hail later in the day Tuesday. Since the timing of these storms will dictate a lot of the severe threat, we'll have a better idea of what to expect by Tuesday morning. 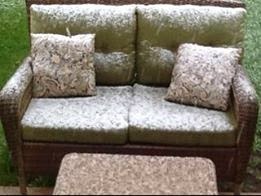 Thank you to everyone who sent in pictures of snow on Friday morning. 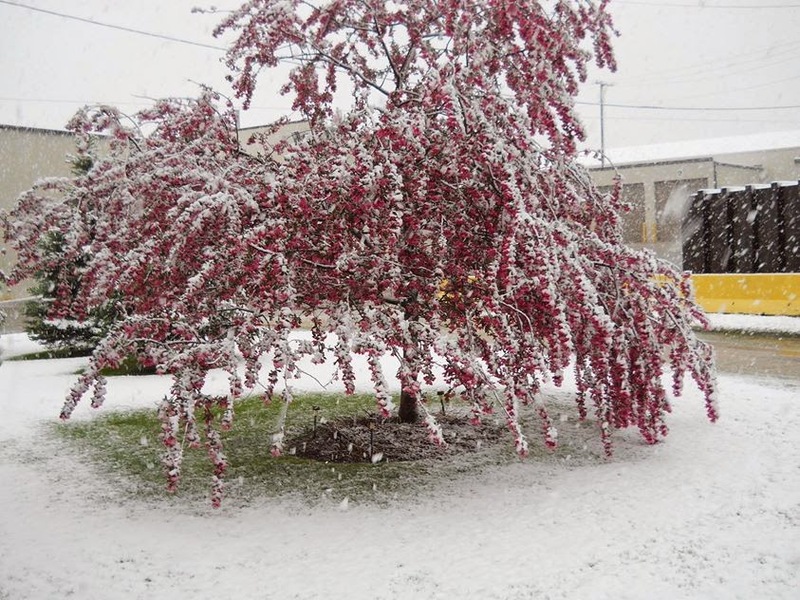 All of the pictures really helped to get a bigger picture of the snow that impacted the region. 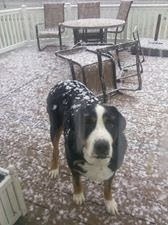 It was definitely a surprise snow, and even in some areas an accumulation of snow. 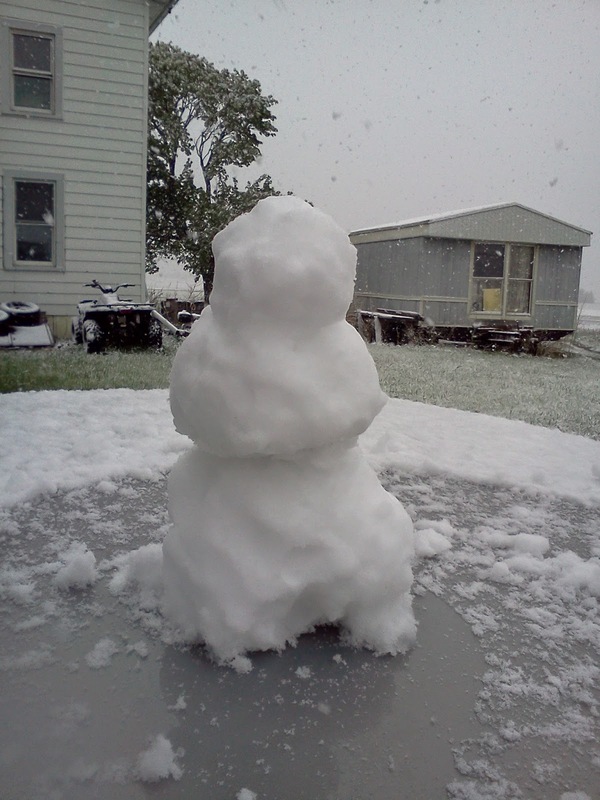 When thinking of weather, you have to look at the atmosphere three dimensionally. What happens up above has an impact on what we see at the surface. 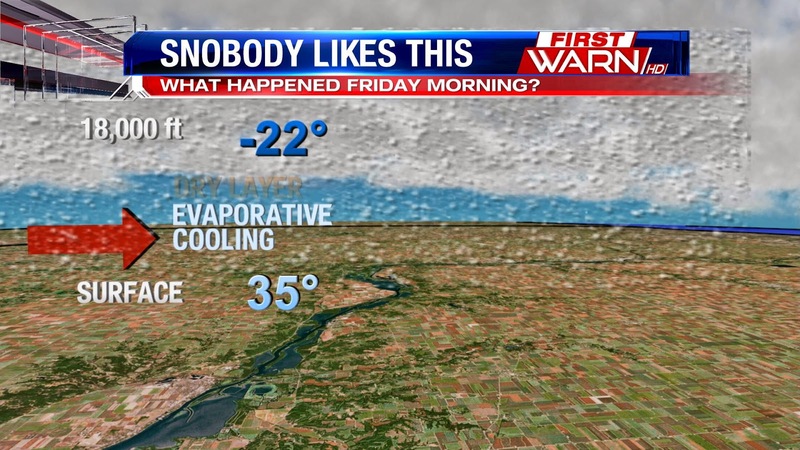 It was an interesting set up in the atmosphere late last night & early this morning - here's what happened. surface at about 3,000 feet, there was a very narrow dry wedge of air. 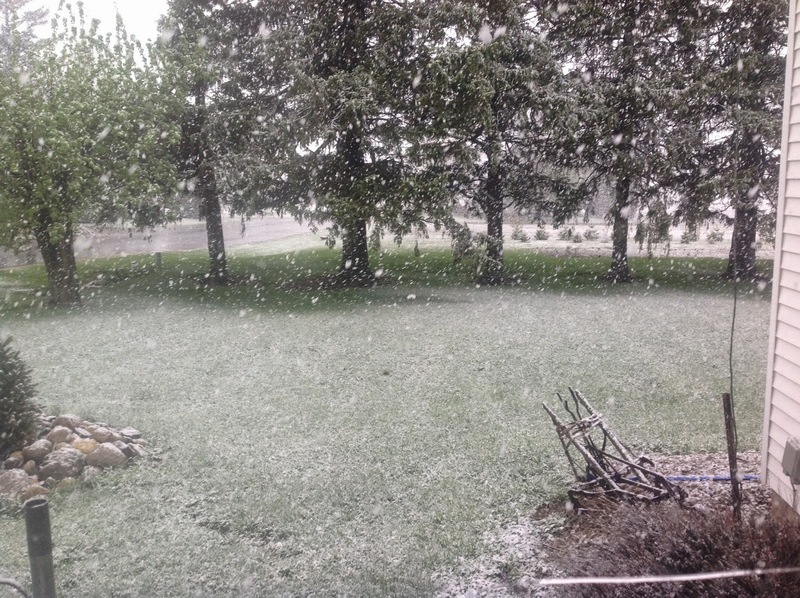 As the precipitation passed through the dry layer, it evaporated which caused the surrounding area to cool. This process is called evaporative cooling. 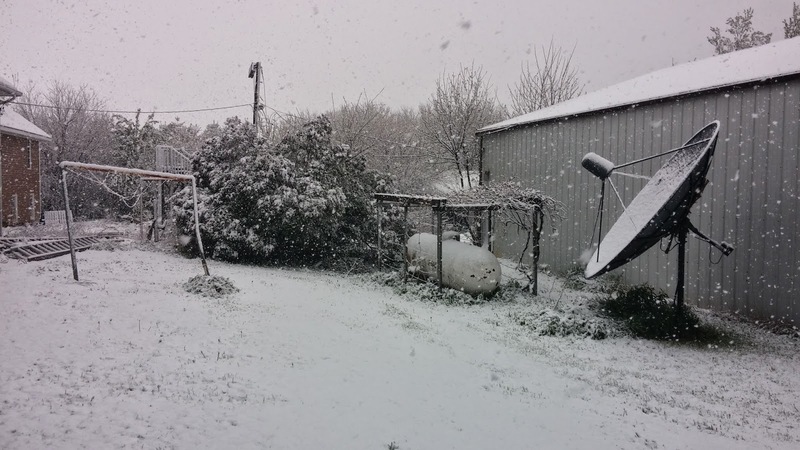 Just south of I-80, there was a strong upper level low that helped provide enough lift and strength throughout the atmosphere to sustain the snow showers through the morning. 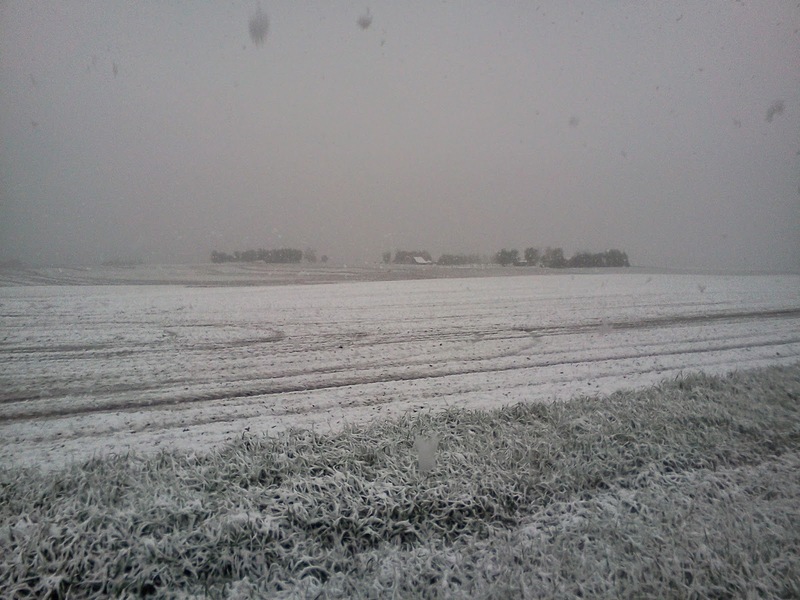 The greatest snow accumulation occurred south of Rockford where between half an inch and an inch of snow fell. 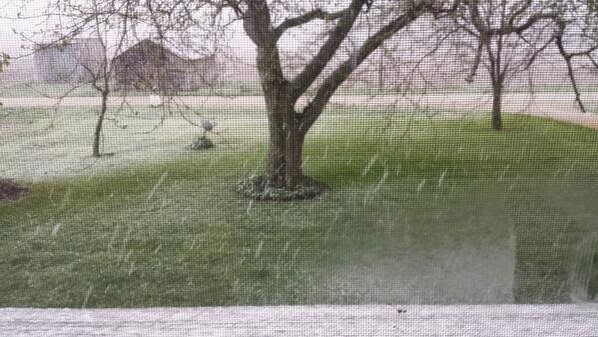 The last time Rockford saw a trace of snow was May 11th, 1966. 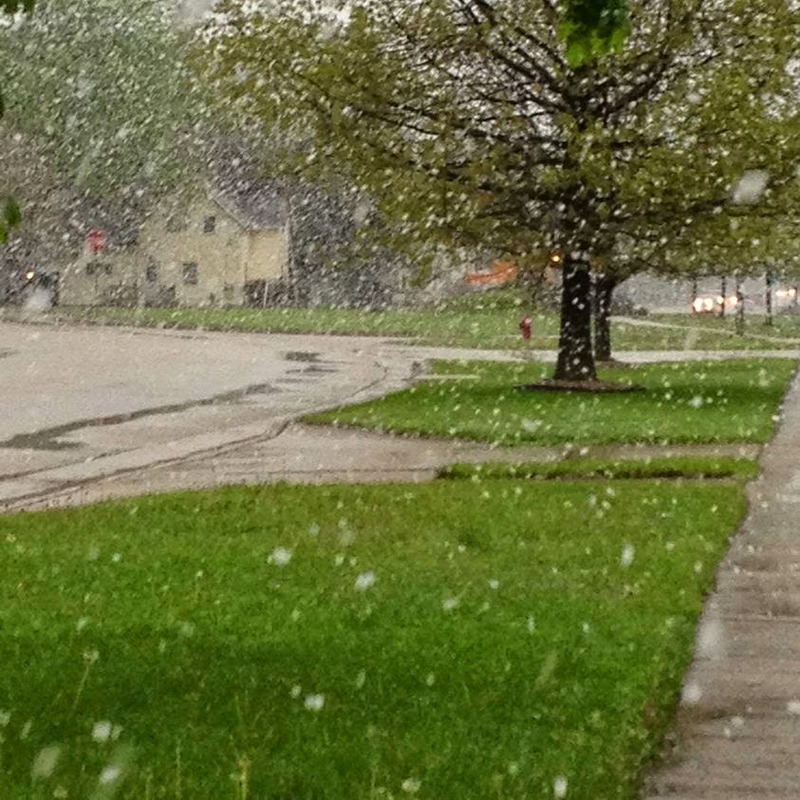 The last observed snow that occurred in Rockford was May 2nd, 2005. 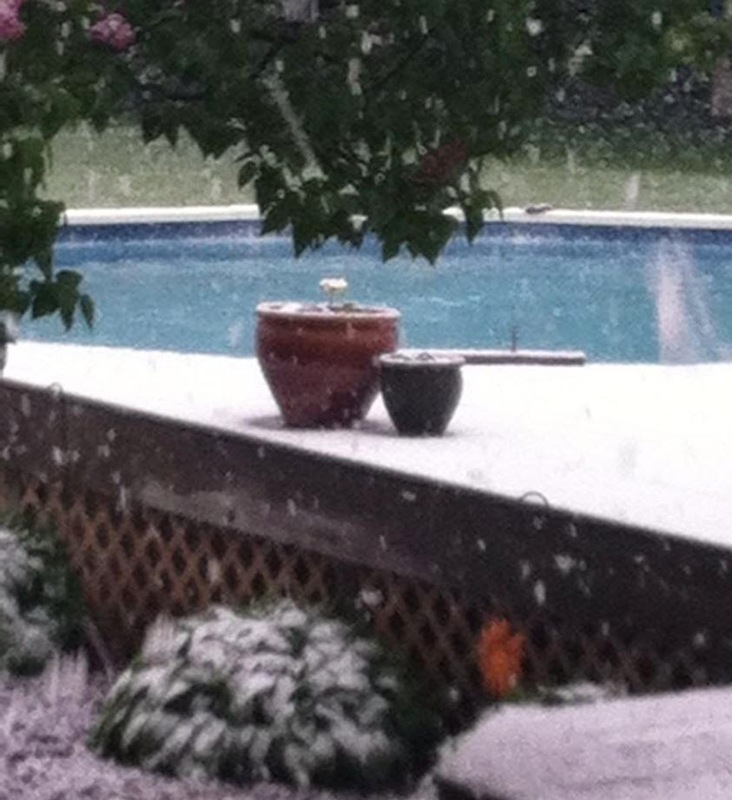 The Chicago Rockford International Airport recorded 0.08" of liquid precipitation this morning. 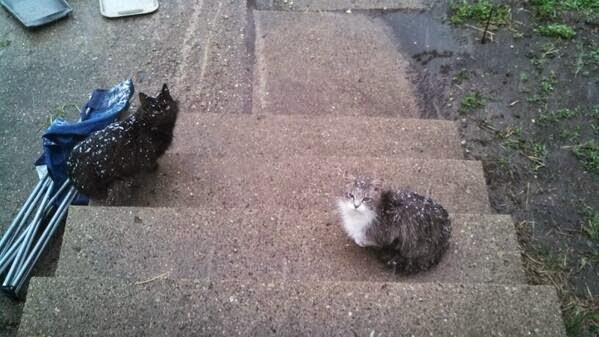 We'll have to see if we ended up with a trace of snow. 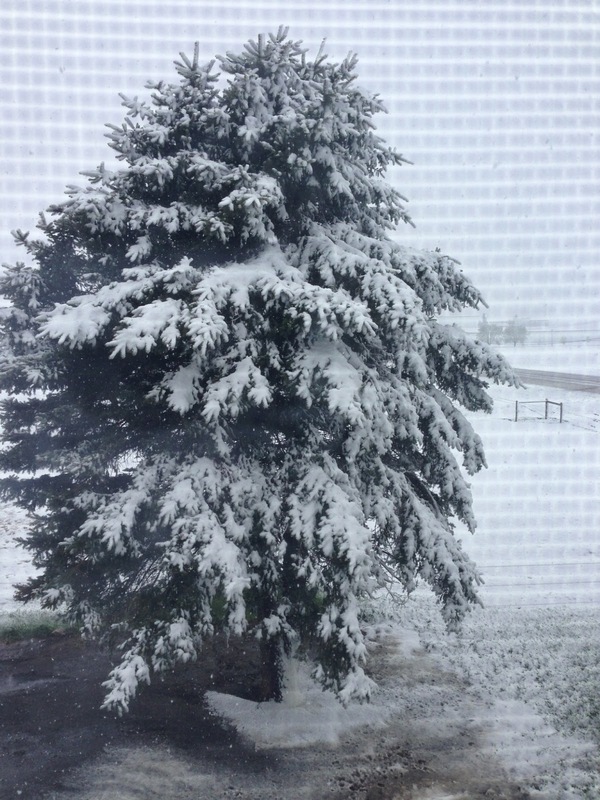 Thank you for sharing your snowy May photos with us this morning!